The man likes spicy food, so I decided to treat him to a red hot dish: Blackened Catfish and Cajun Dirty Rice. The catfish is slathered in butter then coated with every spicy/flavorful herb I could think of. Seared in butter (of course) in a cast-iron pan. It gets smoky. Be warned. Dirty Rice usually calls for chicken livers, but I stuck to my beloved pork sausage and called it heaven. Same spicy herbs went into the rice. Serve with roasted broccoli and pretend you're healthy. 1. Pat catfish fillets dry with paper towel, and spread half the butter on both sides of fillets. 2. 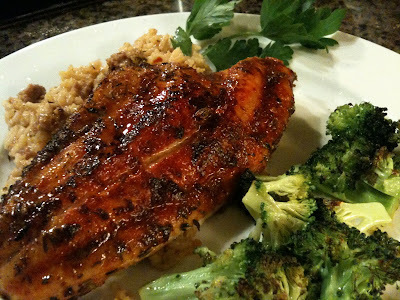 Combine all spices/herbs in a shallow plate, and coat both sides of catfish in the spice blend. 3. 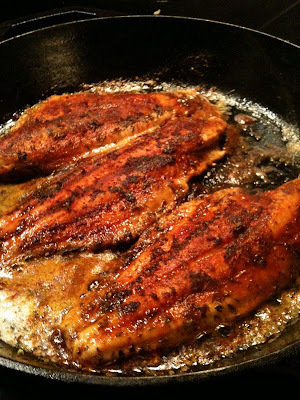 Melt remaining butter in a cast iron pan over medium heat and cook catfish in butter for about 3-4 minutes a side. 1. In large stock pot, brown sausage over medium heat. Remove sausage to plate, reserving fat in the pot. 2. Finely chop bell pepper, celery, onion and garlic and add to the pot. Saute over medium heat until softened through. 3. Add rice and all spices/herbs and cook for 3 more minutes. 4. Add sausage and chicken broth and bring to a boil. 5. Reduce to simmer for 10-15 minutes, or until desired tenderness. 6. Adjust seasonings to taste and serve immediately.